"Monstruillos de Ganchillo" de Christen Haden es uno de los primeros libros de amigurumi que compré. Y me encanta. 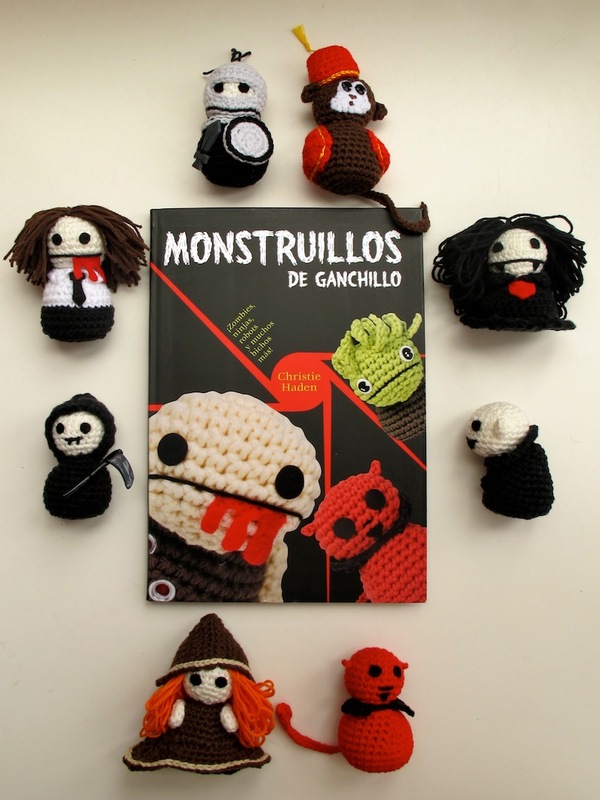 "Creepy Cute Crochet" by Christen Haden is one of the first amigurumi books I got. And I love it. El libro está lleno de pequeños y monísimos monstruos, pero no acaba ahí, Christen tiene su propio blog Needle Noodles donde no sólo da explicaciones detalladas sobre los patrones del libro (yo misma le hice una consulta e hizo un vídeo explicativo sobre ello!) sino que también comparte más monstruillos para hacer siguiendo los patrones básicos que vienen en el libro. La bruja que veréis más abajo no está en el libro sino en el blog (de todas formas yo hice mi propia versión). I should tell you that I've always been very fond of all things creepy like vampires, witches, etc. So this was one of the first things I thought of when I started doing amigurumi. The book is full of super cute little monsters, but it doesn't stop there, Christen has her own blog Needle Noodles where not only she gives further explanations on the book patterns (I've asked her some doubts myself and she kindly made a video about it!!) but also shares even more figures to make with the basic patterns from the book. The witch that you'll see down here is not on the book but it is on her blog (I made my own version anyway). Os presento a "la pandilla"
Let me introduce you to "the gang"
Fall in! | ¡A formar! To make all of the figures I used Katia Yarn Mississippi 3 and a 3 mm crochet.